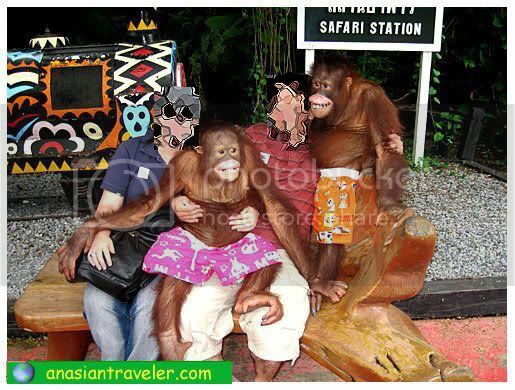 Early in the morning we were picked up by our tour guide and headed off to Safari World for a full day tour. Good thing, our travel agency provided a private van just for us and we were all ready to go in perfect comfort. 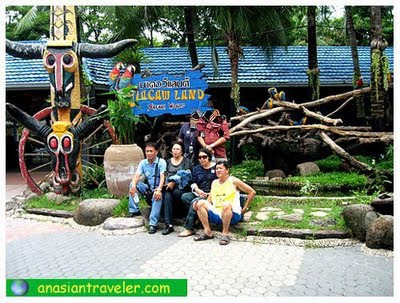 After more than an hour of travel we arrived at this huge open zoo and leisure park that covers an area of approximately 200 acres. 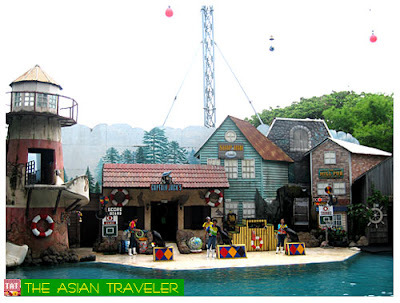 Safari World is divided into two parts - Safari Park and Marine Park. 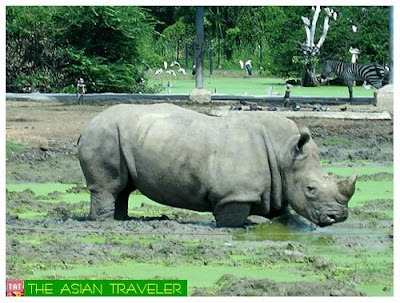 We started off first to Safari Park that houses a variety of animals like zebras, tigers, lions, giraffes, rhinoceros, deers, birds, camels, buffaloes and Himalayan bears in a natural habitat. Along with many other air conditioned coaches and private vehicles, we drove in the comfort of our car through the recreated vast African wilderness setting. On the other hand, visitors are advised not to get out of the vehicle for safety precaution. The best part of the tour was the wildlife feeding show where we got to see the lions being fed by the zookeeper inside a cage. I couldn't believe what I just saw! 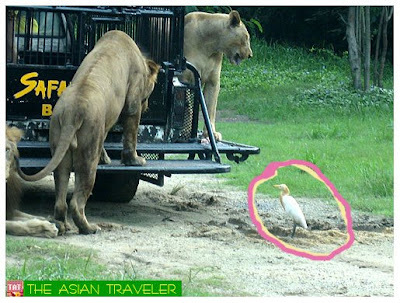 There was a little bird strolling casually around the lion's territory. Hahaha... I would give a commendation certificate to this lilliputian feathered vertebra for showing bravery. Hats off!!! On our way to Marine Park, we saw this peacock sauntering through street side meadows. When our car stopped in front of this male peafowl, he proudly spread his magnificent long green plumage marked with iridescent eye-like spots in fan-like form. The Safari Park was very convenient and safe for us while enjoying the sight and taking photos of these animals. Next we continued the fun exploring the other part of the zoo - the Marine Park. 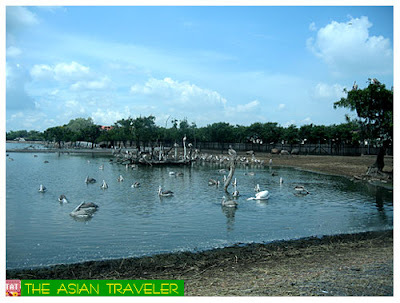 Marine Park houses a gamut of animals from land, sea and air. 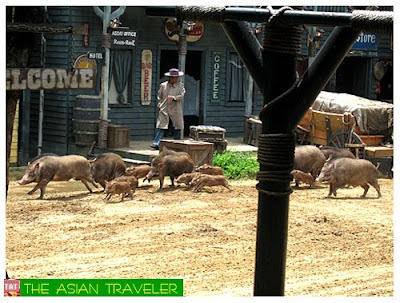 Visitors can enjoy stunts and live-action performances as well. Please remember that all the programs are of a specific time and only one showtime per day. So, if you are on your own better jot down all the schedules. If I'm not mistaken, scheduled shows are posted near the entrance of Jungle Walk or you can directly ask at the information center. The only downside for foreigners is that all the shows here are in Thai language. 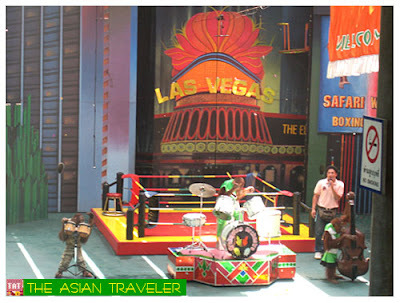 Our tour guide led us to the first show in Safari World - the Orangutans Boxing Show that started at 10:30 am. The highlight is the fight between two primate contenders dressed up in boxing shorts and gloves mimicking the world-famous Muay Thai Boxing. 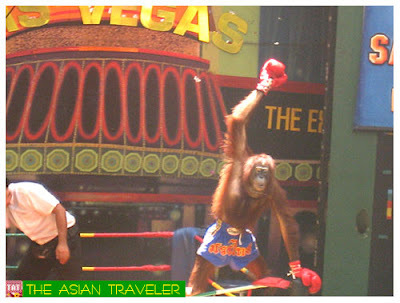 Other Orangutans also showed a few nifty tricks. Then we went to the Sea Lion Show at the Lighthouse Cove. These mischievous sea lions showed lots of tricks and displayed their popular high flying somersaults by obeying the zookeeper's command. 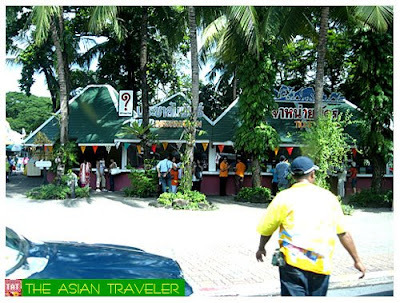 Safari World has two buffet restaurants: Jungle Cruise and Safari. 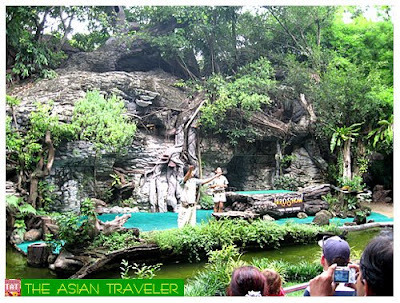 We had our buffet lunch in an air-conditioned Jungle Cruise restaurant that can seat up to 1,700 people. 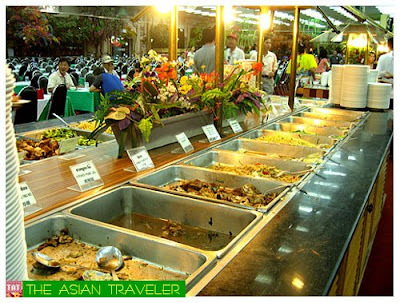 The huge place was in chaotic ambiance and hundreds of people surged forward to the buffet stations in a higgledy-piggledy line. There were plenty of food but I wasn't very impressed with most of the offerings. Some tasted pretty bland, this I believe the result of mass production where the method of cooking is below quality. 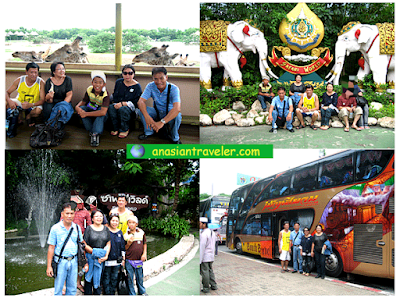 On the lower level of the bridge is the Rungsit Boat Noodles and we stopped by at Macaw Land for picture taking. 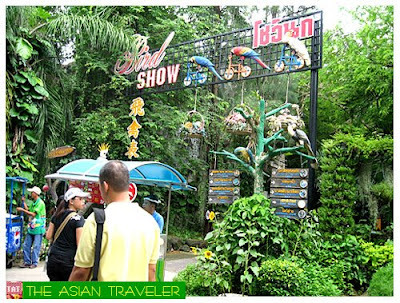 You can witness several long-tailed brightly colored parrots here . Shortly we went to Safari Terrace, a feeding station in an elevated porch where you can see the towering Giraffes at very close range and you get to actually feed them. You can buy a pail of bananas at the counter. The last exhibition that we witnessed was the Bird Show. We had a little picture taking at the entrance / exit gate. Soon after it was time for us to bid farewell to Safari World and we were transferred back to our hotel. To be honest, at first I had a very low expectation about this trip but surprisingly hb and I and the rest of the family had a great time and we enjoyed it so much. 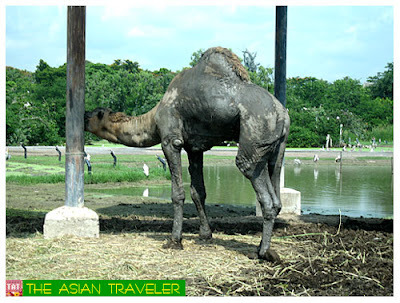 Safari World offers a full, fun filled day out with a great variety of entertainment. 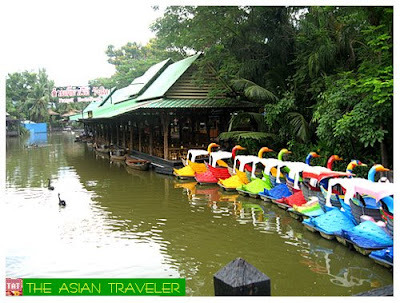 It is one of the best attractions in Thailand for the young and the young at hearts. 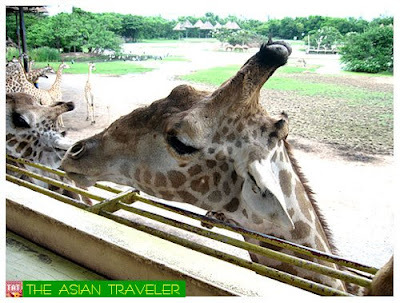 Safari World is located at Km 9, Ram Indra Road, Minburi, more than an hour drive north of Bangkok. where is safari world? singapore? I thought you're now in Africa . 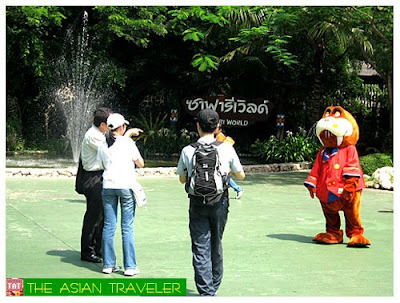 Haven't heard of Safari World in Bangkok. Looks like the tigers aren't too scary at all. I enjoyed viewing the photos. 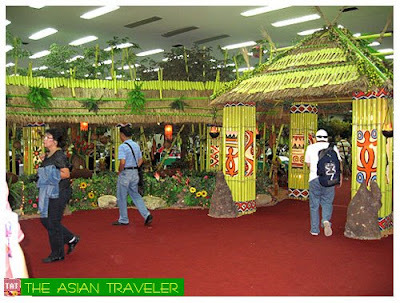 I just wish our postponed travel to Bangkok would push through soonest. Any advice for a would be Bangkok tourist? Btw, Thanks for the link. I have linked you on both my blogs. hey, i suggest you post your pic, re. the lion and the fragile inquisitive bird in you tube. might be nice to watch by others! I love the idea, but Youtube is a video sharing website. Likewise, great review my friend! So many activities can be done here. Really nice place to hang around. oh! i wanted to visit this but didn't have the time. thanks for sharing! I enjoyed viewing your photos. I just wish I could enjoy the scene personally! 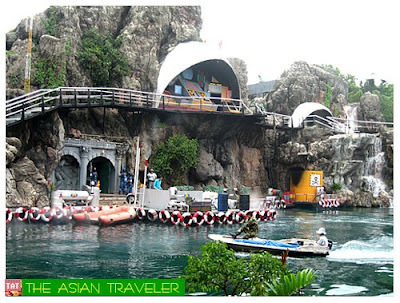 Didn't know that Thailand has that beautiful theme park. 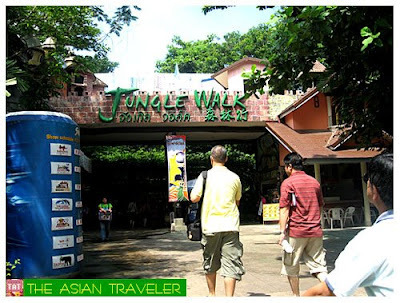 HI, I have tried to find the website that can tell me the price of the ticket to Safari World but what I have found are just about what they have in there. Safari World official site does not even have that info on. Where can I find that? Thank you for sharing the outstanding post.